Spier Wine Farm in Stellenbosch is not only one of the most beautiful farms in the country, boasting a world-class hotel, two fantastic restaurants, an excellent conferencing centre and award-winning wines, it also leads the way in terms of sustainable and ethical farming. There was a time when Spier was considered to be a little too commercial. But the farm has come a long way since then. Before 1992, there was no hotel, no conference centre and no restaurant. All that stood on the grounds was the old manor house and an old wine tasting building. So, yes, things have been built up a fair bit, but the real story is the ethos of the farm, which is focused on sustainability, ethical farming and working with and giving back to the community. To say that Spier is committed to its ethos would be a massive understatement. Currently, 100% of its water and 95% of its waste is recycled, with a goal of 100% firmly in place. At some point, the hope is that everything will be given infinite life, including furniture. It’s an impressive operation. There are 400 water-saving devices on showers, basins and toilets around the grounds, natural light and ventilation and energy-efficient lighting is used where possible, all in line with the aim of reducing municipal water usage by 50% and carbon emissions by 30% by 2017. Bins have been made out of old wine barrels, light fixtures from old bottles… you get the picture and it is a hugely encouraging one. And it certainly doesn’t stop there either, in fact, it’s just the beginning. The restaurant menus change seasonally, dependant on what is available in the farm’s own vegetable garden. And it goes without saying that all the vegetables are grown without the use of antibiotics or chemicals, while all meat used comes from the cattle raised on the farm, eggs from free range hens, and any fish served is graded as the most sustainable by The South African Sustainable Seafood Initiative. Spier practices responsible and sustainable farming with as much food as possible sourced from the farm, with all other produce brought in from trusted nearby farms. The cattle is grass-fed and free of any hormones and antibiotics, while eggs are laid by hens allowed to roam freely on the Spier land. 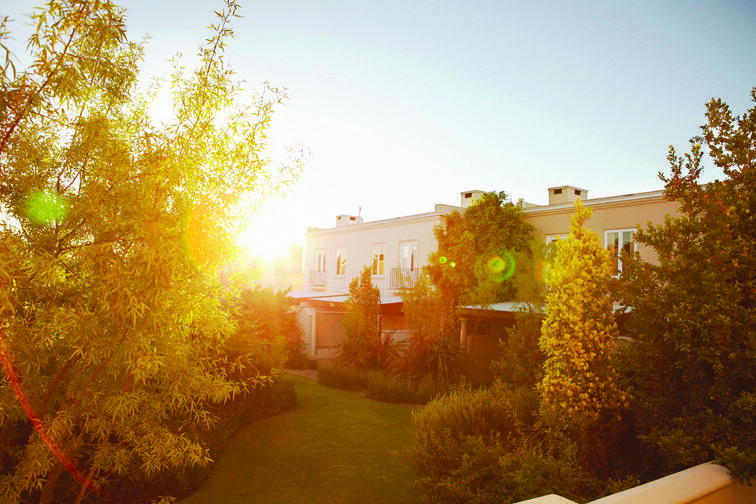 All of this, in turn, lends itself to the farm-to-table experience to be enjoyed at Eight and the Spier Hotel Restaurant. 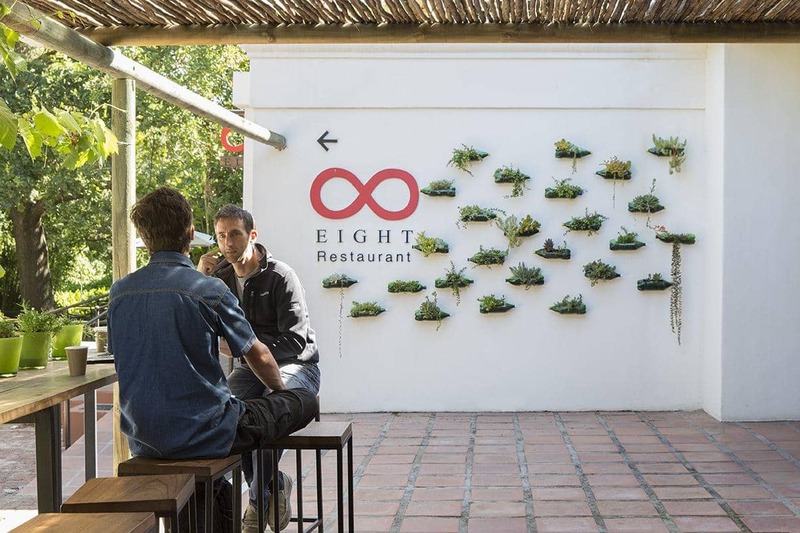 Eight’s décor also very much embodies the ethos of Spier. The ceiling on the terrace has been has been lined with over 10 000 individually crafted flowers made from recycled white plastic milk bottles, and lit with low voltage LEDs. The light fittings in the main part of the restaurant were made from recycled plastic bottles. But despite all of the work towards sustainability, the one thing that really stood out for me was the work being done with the community. So much work has been done to improve the lives of those around the farm and those working the sprawling 600 hectare property. The company’s Social Investment Committee is wholly committed to funding projects focusing on HIV/AIDS orphanages, child-headed households, and economic and social development. And it’s not just lip-service. There has already been great success with projects such as Treepreneurs, Lynedoch School, Debinisa, Bernie’s Laundry, The Creative Block and Frieda’s Vine. It is also clear from chatting with my guide for the day, Wiseman, that Spier is just as committed to ensuring its own staff’s upliftment as it is to the outlying communities, with its practices ensuring it was the first South African business to be Fairtrade accredited. Spier is a beautiful farm, complete with all the trappings and splendour that would be expected from a wine farm of its stature, but thankfully the beauty here is not just skin deep.